Take my words to the bank – an exercise bike is what your home gym lacks to make it fully equipped and modernized. Exercise bikes have become very important and are recommended by fitness specialists all over the world for workout routines. 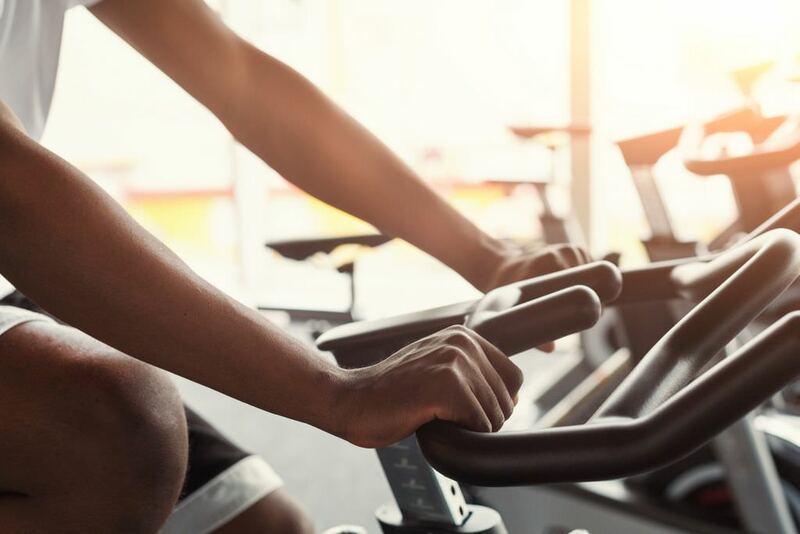 The current market is flooded with a variety of recumbent bikes, and it is confusing, to say the least when it comes to choosing the right one. You need to find the best recumbent bike for seniors, especially if you are one. So making the right selection is vital. Read through this article, as I will take you through the features of the best recumbent bike for seniors along with their pros and cons, brief buying guide, and find out the winner in the end. Five Things To Consider When Buying A Recumbent Bike? 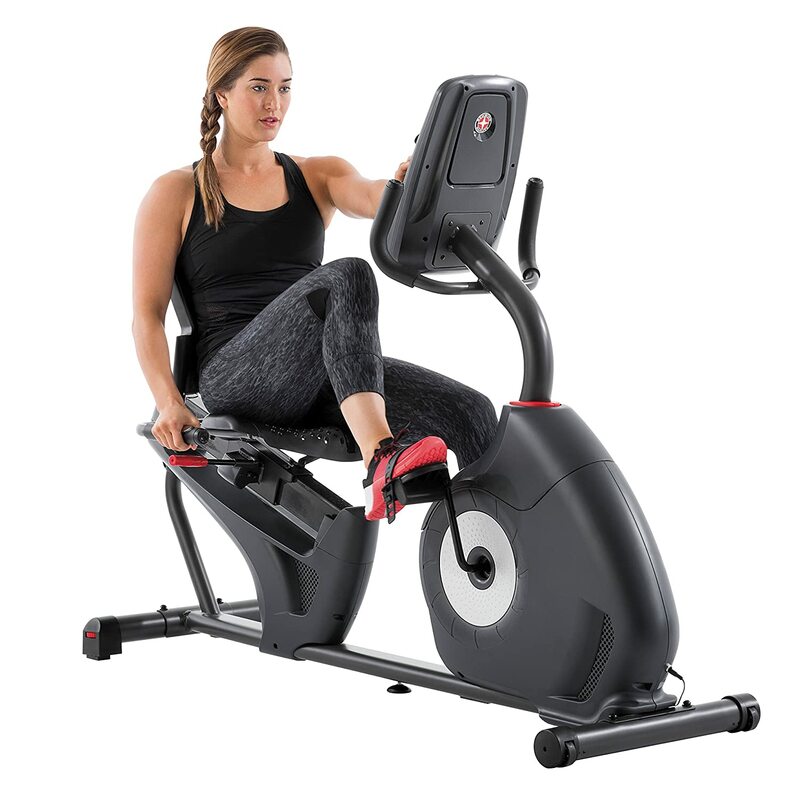 The Exerpeutic 4000 magnetic recumbent bike is a reliable bike with 12 pre-set workout programs, and you can get it at an amazingly low price. It is fully incorporated with a heart rate control, speakers to keep you entertained, and much more. It is highly recommended for a home gym because of its adjustability and double profile nature. With your fixed budget, you can have an ME-709 Recumbent Bike that offers useful features to shed pounds easily. This is the only bike that offers great features at an amazingly fair price. This bike is suitable for anyone whether you are a fitness fanatic or a novice. 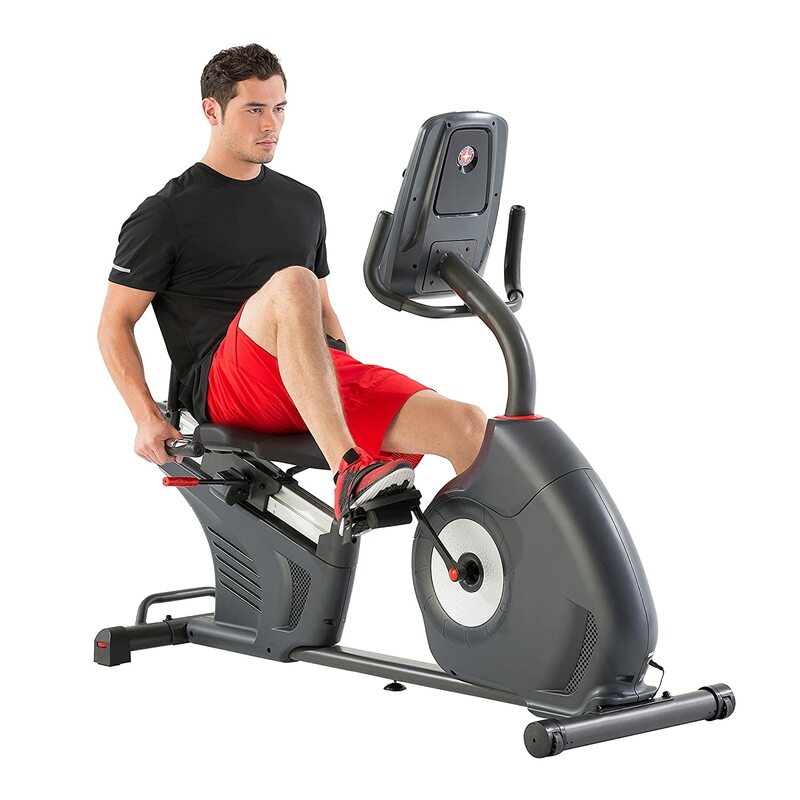 The Exerpeutic 900XL Recumbent Bike is a popular exercise bike because of its price. It is not sophisticated with tons of features, and this makes its cost lower compared to other Recumbent Bikes. How often do you find an airsoft seat in the gym? Or a Bluetooth powered device? 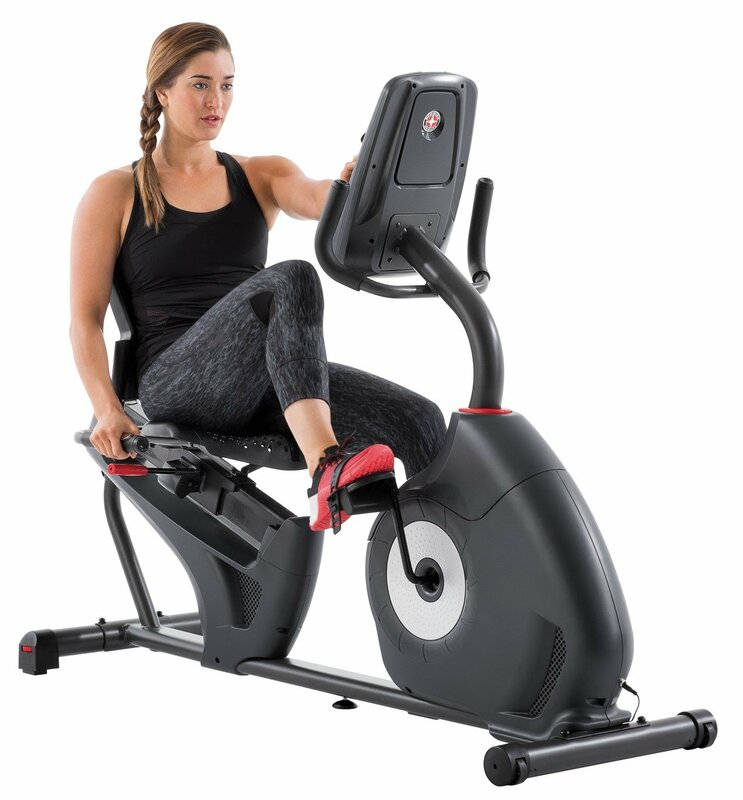 This is one amazing bike that has a mind-blowing collection of features that will make you not only comfortable but also greatly improve your experience in the home gym with full-time entertainment. This bike comes with a well-balanced flywheel for a smooth, noiseless ride and oversized pedals to make feet adjusting possible. The surprises don’t end here as it has a maximum weight that can accommodate a variety of people weighing up to 325 lbs. So you can train on this bike comfortably even if you are overweight. This bike is not the conventional type as it is equipped with the latest features. It has a four heart rate workout program which monitors your beats and analyzes the data to evaluate the condition of your heart. With Bluetooth technology and mobile tracking, this recumbent bike can share your exercise data through the exclusive Exerpeutic app. Hence, it is possible to view your performance from the comfort of your couch at home. Worried about your heart rate? This bike monitors your heartbeat through the handle grips. For full hydration during the workout, the bike has a water bottle holder. So you do not have to worry about drying out. 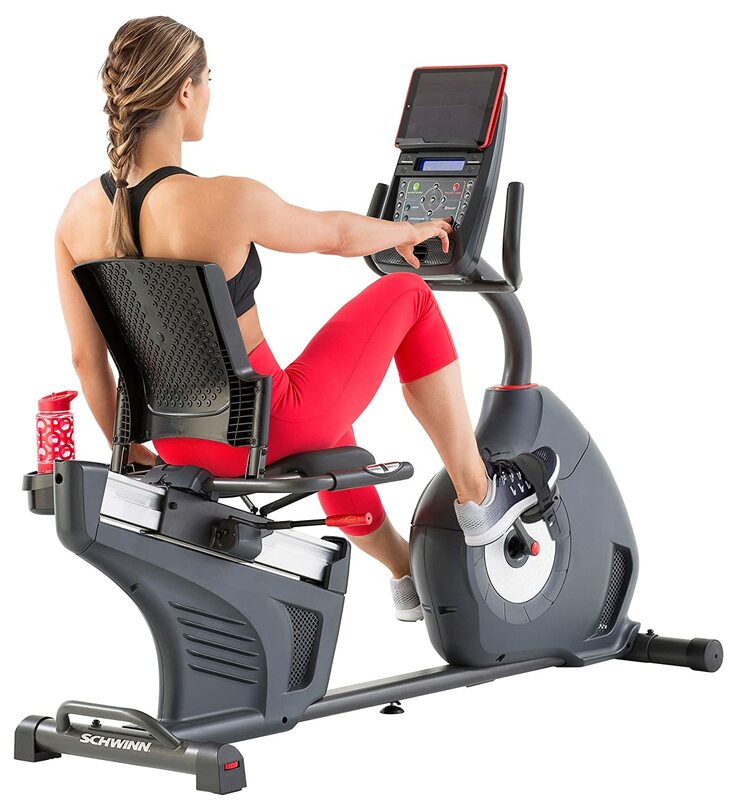 This is an amazing exercise bike that gives you the comfort you only get in your office. The chair has an office look, fully fitted with armrests and airsoft padding. Besides, the bike is easily movable since it has a transport wheel that makes moving easy. If you already have a mini gym at your home, you do not have to worry about how this bike will fit in without making it look overcrowded. This bike has the best dimensions. It is 41 inches in height, 30 inches in width, 58 inches in length, and weighs about 71 lbs. These physical dimensions are good even for a small home gym since it occupies hardly any noticeable space. It may not fit people around 5″ tall. They tend to have trouble adjusting their seat. Just have a test drive before you make a purchase. Schwinn 230 is one more bike from the house of Schwinn with most features. Despite its pocket-friendly nature, this bike does not compromise its quality and offers 22 workout programs. It is fully incorporated with a heart rate control, speakers to keep you entertained, and much more. It is highly recommended for a home gym because of its adjustability and double profile nature. Schwinn 230 Recumbent has a flywheel that weighs 13 pounds which makes you apply enough effort to keeps your muscles strong and flexible. This exercise bike is custom made for your home gym. It is not very heavy and uses the same mechanism as the cheaper Schwinn 220 Bike. You should consider buying this exercise bike because of the amazing benefits it offers. USB data transfer is enabled so that you can share workout data. Schwinn 230 is compatible with MyFitnessPal. This bike is user-friendly as it can be adjusted to fit riders with different heights. The flywheel is not heavy enough which turns a disappointment to some users, who prefer heavier flywheel. This is the only bike that offers great features at an amazingly fair price. This bike is suitable for anyone whether you are a fitness fanatic or a novice. This exercise bike comes with mind-blowing features. The best of them being, the 29 programmed workouts, mobile-device connectivity and the technology to download your training data. Getting in the best shape with the great comfort is now a cinch when you buy this recumbent bike. This exercise bike monitors your heart rate on the handle-bar grips and a chest-strap for telemetry. Who doesn’t like some soft music during a workout? This bike is fitted with the latest iPod speakers while some have mp3 players to keep you entertained as well as a 3-speed fan to maintain room temperature. The weight of the bike is highly compensated by the transport wheels that make it easily mobile to any corner of the gym. You just need to push it around. Water holder is the ultimate feature that will surprise you. You need to be fully hydrated during a workout. This bike ensures you go longer. The data that will be recorded range from the speed of your workout, time spent on the machine, distance covered, revolution per minute, your heart rate, and the resistance. With all that data you can easily make deductions if you’re making improvements and know what is preventing you from physical perfection. You will need $50 to get the chest strap. If your budget is fixed, then you will have to forego it. With your fixed budget, you can have an ME-709 Recumbent Bike that offers useful features to shed pounds easily. This exercise bike has features that consist of fore and aft adjustability, flexible handles that can be adjusted to your comfort, offers different resistance levels and a monitor to see exercise stats. This exercise bike can take aboard a spectrum of people since it has a higher weight capacity compared to other exercise bikes. It offers the benefits you would get from your daily cycles up and down the streets. The positioning of the pedals ensures stress is placed on your knees hence strengthening muscles around the knees, ankles as well as your back. The bike measures 55″ by 40″ by 25″ and weighs 661 lbs. This recumbent bike has 300 pounds weight limit, but heavier people have used it without a complaint. However, following the manufacturer’s guidelines is vital. This Recumbent Bike has a collection of features that will ensure satisfaction during workouts. It has 8-level resistance system, and you only need to turn a knob either clockwise or anti-clockwise to move either one level higher or lower. With a monitor, you can easily check the workout data which include time, distance, speed, and calories used during workouts. With adjustable seats, users of all heights can be trained with improve comfort. This bike also allows forward and reverse cycling since its pedals are precisely counterbalanced. With adjustable handles and foot straps, comfort is greatly improved. This bike is also fitted with transport wheels making relocation easier and safe for both you and the machine. Magnetic resistance ensures a smooth steady and almost silent cycle. 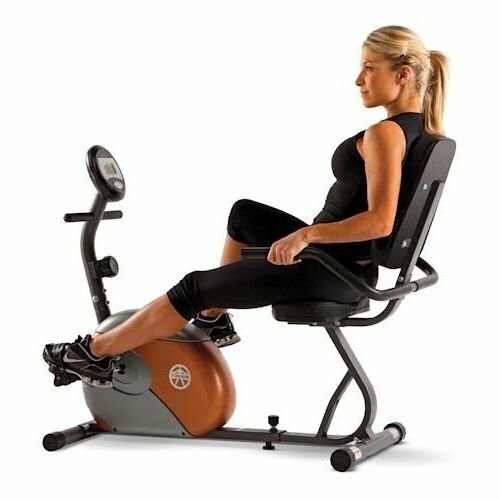 The Exerpeutic 900XL Recumbent Bike is a popular exercise bike because of its price. It is not sophisticated with tons of features, and this makes its cost lower compared to other Recumbent Bikes. Besides, the heart rate monitor is in the hand grips, this exercise bike is very simple, and it is preferred by many fitness experts. It is designed in a user-friendly way and comes with a durable design. With this Recumbent Bike, it is easier to get on and off the machine. With a weight limit of 300lb, this exercise bike accommodates bigger users despite its weight being just only 63lbs. The Exerpeutic 900XL Recumbent bike measures 34 inches in height, has a width of 22 inches, a length of 54 inches and weighs 63 lbs. This exercise bike is suitable for a modest gym. It has precisely balanced flywheel operated by a V- belt for smooth and silent operation. Your body temperature will be monitored in the hand grips. It will ensure your body does not overheat. This bike offers perfect resistance with an 8-level magnet resistance system. 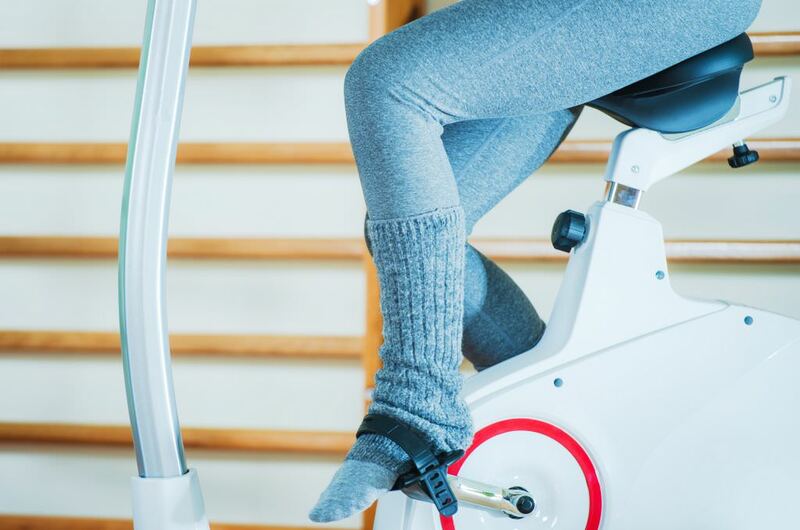 For additional comfort, this exercise bike features large pedals and straps to prevent your legs from slipping. Moving this exercise bike will not be a problem since it is fitted with transport wheels. Exerpeutic 900XL Recumbent Bike comes with the latest technology. It has an LCD display and additional features that allow you to go through your workout data. Inclusive in the workout data is the distance covered, calories burned, time spent during each workout session, your cycling speed and heart rate. When shopping for the best recumbent bike for seniors, you must consider some factors to choose an exercise bike that provides expected body fitness and comfort while being durable enough. Select a Recumbent Bike with padded seats for added comfort as well as with armrests for support. The seat you choose should be adjustable both forward and backward. This will come in handy if others are using the exercise bike. Whether leaning backward or forward, you should be able to see the display on the screen. Choose one that has the best view. You do not want to get bored during your daily workouts since they can soon turn out to be monotonous. With an mp3 player or your mobile phone, you can listen to your favorite tunes as you do the workouts. Choose an exercise bike that is compatible with any of the above. A recumbent bike with higher resistance levels keeps you on the run and makes your body to improve greatly. Achieving new challenges will keep you motivated. Of course, you do not want the monotony of doing the same workouts all year out. 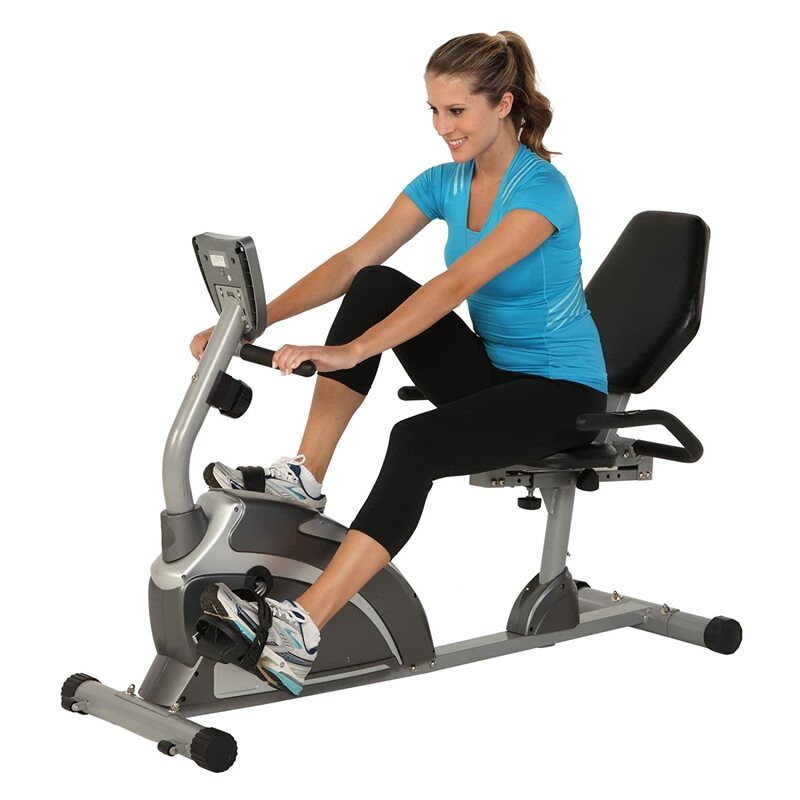 Getting the best quality exercise bike ensures you have a great experience as well as durability. Choose the one made of the best material. Touch the material used in making the seats and closely evaluate them or else in just a month, you will be thinking of replacing your exercise bike seat. Considering quality, the price should also be reasonable. Ensure you buy from a genuine dealer, and if you do not trust any, Amazon gives the best offers. With the above best Recumbent bike for seniors available, personally, I would go for the Exerpeutic 4000 magnetic recumbent bike. The features are amazingly good for less than $500. It is made of good quality materials, and the fact that it has features like the precision-balanced flywheel and 12 pre-set workout programs makes it irresistible. Its comfortable backrest with complete arm support along with quality elbow-rest pads ensures it is the ideal exercise bike for seniors.